Today, the popularity of working an allotment in Bishopthorpe means that gardeners first have to join a waiting list. THE HISTORY OF THE ALLOTMENTS begins with an 18th century Enclosure Act. At this time, allotment meant a piece of land given to a parish or manor official in exchange for rights and holdings held in the open fields system. 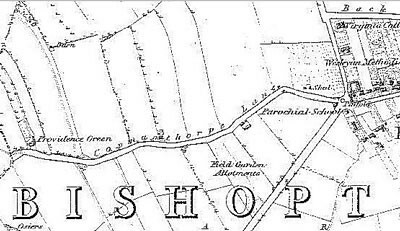 In 1760, an enclosure act was drawn up for Bishopthorpe in which 2 acres 1 rood and 2 perches of land on the ings were given freehold to the “Trustees of Bishopthorpe Poor”. We do not know exactly what happened to this land, but on the Ordnance Survey map of 1851, which was surveyed in 1846, there is an area shown as “Field Garden Allotments”. A section from the 1851 Ordnance Survey map showing the Field Garden Allotments between Copmanthorpe Lane and Appleton Road. These allotments were lost when the railway was built. This land, like much of the land in Bishopthorpe, was owned by the Archbishop and lies between the present Copmanthorpe Lane and Appleton Road where Bridge Road, Appleton Court and part of The Coppice now stand. This piece was divided into 28 small plots, 26 of which were worked by people who lived in the village at that time, and almost all of whom appear on the census of 1851. These seem to be more like the small plots we think of as allotments today. During the period from 1867 to 1871, this land was bought by the North Eastern Railway for the construction of the East Coast Main railway line to London. In January 1895, the first meeting of the Bishopthorpe Parish Council took place. The early minutes were concerned with the provision of allotments. Various land owners were contacted to see if they would let land for this purpose. At the March meeting of the Parish Council, the Ecclesiastical Commissioners replied offering several fields including fields 119 and 126 shown on the O. S. map of 1893. These two fields became the present garden allotments. 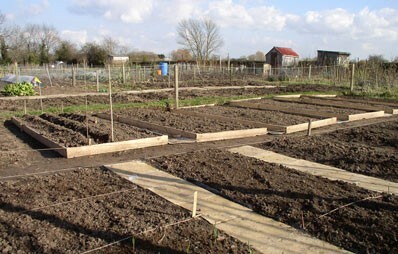 April 2008: Preparing seed beds at the allotments in Acaster Lane (field 126). The Parish Council has Allotment Rent Books dating back to 1931. At that time there were 26 garden allotments on Appleton Lane (Road). Each one was half a rood in size (1/8th of an acre or about 26 x 25 yards). These were let at 7s 6d per year (38p). Field 126 in Acaster Lane was divided into three half-acre plots. In 1934 these were subdivided into 6 plots of various sizes at various rents and in 1950 further subdivided into 14 plots. Today there is not a great demand for large plots so further division has taken place and there are now 35 plots. The current rents are calculated at 0.5p per square foot per year and average at £10.00. The Parish Council pays a rent to the Church Commissioners and runs the allotments as a business, which makes a small profit. 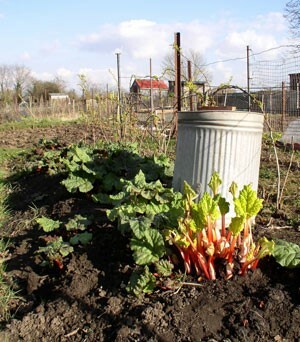 In return, it provides some maintenance for allotment holders. In 1994, about half of the Appleton Road site was sold for the building of housing (now The Orchard) and the remaining space made into 27 plots. The first record of one of these societies that we have in Bishopthorpe is in the Robin Hill Collection. This tells us that in 1948 there was a Bishopthorpe Allotment Holders and Gardeners Association with 153 members. This seems quite a large number considering the size of the village at the time. Members paid 1s 6d (8p) per year. For this, they were able to buy supplies at favourable prices. There were seed potatoes at 3s (15p) per stone, vegetable and flower seeds, hop manure, artificial and organic manures ranging from basic slag at 1s (5p) per stone to fish guano at 5s 9d (32p) a stone; and lime at 1s 6d (8p) for a cwt bag. The secretary was H. Roberts and as well as organising the sales, he arranged several social events. There were film shows and lectures, an outing in 1948 to Sledmere Hall, a social evening with whist (to which members could take ONE lady), a ventriloquist, refreshments and dancing. But the big events were the Annual Shows. These took place in the Reading Room, now the Village Hall. One such Show was held on Saturday, September 4, 1948. There were 34 classes for vegetables, fruit, flowers and preserves and one class for children under 15 years for a posy or display of wild flowers. It must have been quite a formal affair and was opened by Lt. Col. W. F. Tyndale G.M.G., D.S.O., J.P. Each class had three prizes of 3s (15p), 2s (10p), and 1s (5p), and 12 special prizes of 5s (25p) were given also, but the top prize was 10s (50p) for the best potatoes. At the end of the show, the exhibits were sold. Tom Evans has left the Bishopthorpe Archive a lot of information about the allotments. He was a very successful allotment holder, winning prizes for his vegetables during the 1960s. 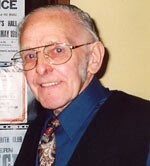 He served on the committee of the Bishopthorpe Gardens Guild and was also the Honorary Secretary of the Bishopthorpe Social Club, Allotment and Garden Section. When the Church Commissioners wanted to terminate the lease for the allotments in 1968, he fought passionately to prevent this. Tom enlisted help from the National Allotments and Gardens Society Ltd. and the Parish Council to see if two fields on Acaster Lane (126 and 139) could be registered as a common. In the same year, he also formed the Allotments and Garden section of the Bishopthorpe Social Club one aim of which was to, “form a united front to obtain security of tenure for allotment holders”. It is not clear from his notes how successful this action was, but plans to terminate the lease for field 126 seem to have been abandoned, whilst field 139 was built on as part of Keble Park. However, in 1990 planning permission was sought for the building of houses on the Appleton Road allotments (field 119) as there were many vacant plots. After considerable negotiation between the planners, Church Commissioners and the Parish Council, development was granted on part of the site which is now The Orchard. It was recommended that the Church Commissioners should transfer ownership of the rest of the site to the Parish Council thus ensuring that the land should remain as allotments “so long as it is required for that purpose or some other form of public space”. Parliamentary Enclosure Act for Bishopthorpe of 1760. Allotment Rent Books 1931 to 1980 and Parish Council Minutes 1895. (Bishopthorpe Parish Council). The Robin Hill Collection and Tom Evans Collection. (Bishopthorpe Archives). ← A rock and roll Panto!